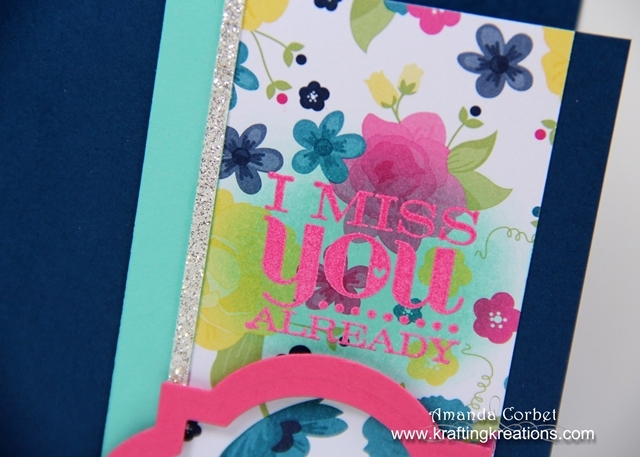 Krafting Kreations: I Miss You Already! Good morning! Today I’m going to share with you the last sketch challenge on Stampin’ Connection. The design team has decided that due to lack of participation and time constraints in our personal lives, that it is time to end the weekly sketch challenges. So here is challenge 172! I thought this greeting from Really Good Greetings was so fitting for this challenge! I wanted to work with what I already had scattered across my work table. Seriously, it looks like a tornado ripped through there….again! I can only manage to keep the table top clean for maybe a week. If that! Oh well… such is the life of a crafter. Anyway… I started off with a 5-1/2” x 8-1/2” piece of Midnight Muse card stock and scored it at 4-1/4”. Next I cut a piece of Gingham Garden DSP 2” x 5-1/2”. 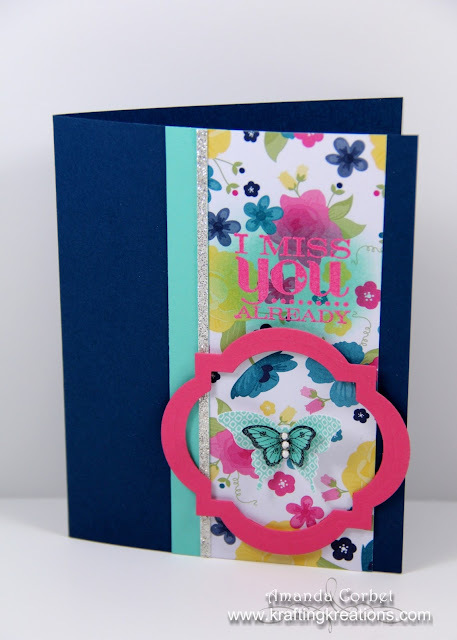 I stamped the greeting from Really Good Greetings onto the top of the DSP in Versamark ink, covered the stamped image with Melon Mambo embossing powder, and heated it with my heat tool. The greeting was blending in with the DSP colors too much for my liking, so I took a sponge dauber and sponged a Coastal Cabana halo around the greeting. Ahhh…. Much better! Next I cut a piece of Coastal Cabana card stock 1/2” x 5-1/2” and adhered it right next to the DSP. I cut a piece of Silver Glimmer Paper 1/8” x 5-1/2” and adhered it on top of the Coastal Cabana card stock right next to the DSP. I just have to add bling you know. The Strawberry Slush frame was in my scrap bin after being discarded from another project, so I grabbed it up, added a few pieces of Stampin’ Dimensionals onto the backside, and adhered it onto the card front. For the centerpiece in the frame I stamped the larger butterfly from Papillion Potpourri onto a scrap of Whisper White card stock in Coastal Cabana ink. 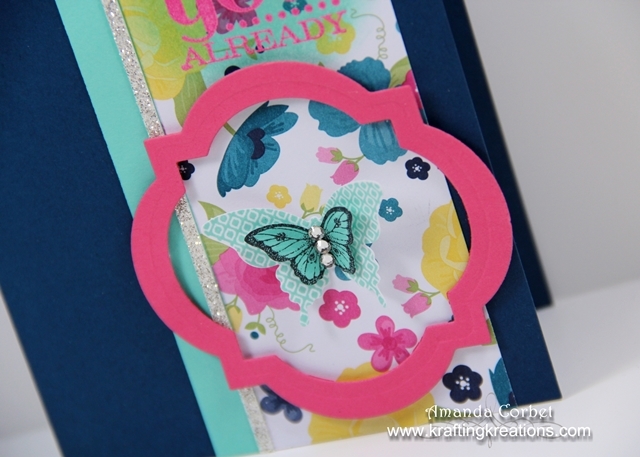 I stamped the smaller butterfly onto a scrap of Coastal Cabana car stock in Black Stazon ink. 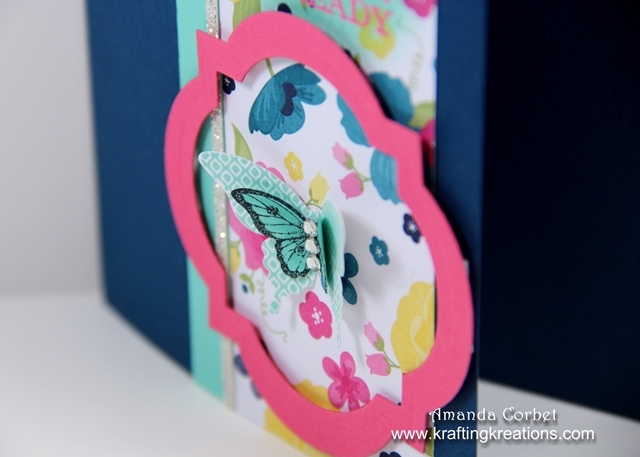 I punched out both butterflies with their coordinating punches, adhered them together, added some Rhinestones into the center of the smaller butterfly, and adhered the butterfly onto the card front with a Glue Dot. I am a little sad to see this challenge end, but there are many past challenges that you can find on the Master Sketch Challenge List (if you’re a Stampin’ Up Demonstrator). I hope you get a chance to play along with this final sketch!